UCT has been ranked among the top 100 universities in the world for eight of its subject areas, according to the QS World University Rankings by Subject released on 8 May. 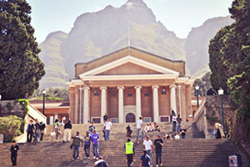 UCT was ranked at 32 for its Education and Training subject area. The other seven subject areas are: Earth and Marine Sciences, Politics, Psychology, Law and Legal Studies, History and Archaeology, Geography, and English Language and Literature. Regarded as one of Africa’s leading universities, UCT‘s consistent performance in world ranking systems speaks to the university’s commitment to quality research as well as first-rate higher education. This year UCT features in 19 of the 30 subject areas measured by QS, which ranks the world’s top 200 higher education institutions. Three of UCT’s subject areas, Agriculture, Civil Engineering and Politics, have also been rated for the first time. For the third edition of the QS World University Rankings by Subject, 2 858 universities have been evaluated and 678 institutions ranked in total. The surveys are complemented by three other measures: the citations per faculty, as indicated by SciVerse Scopus (20%), the staff-student ratio (20%), and the degree of internationalisation, measured by the proportion of international students (5%) and the proportion of international faculty (5%). For more information on the QS World University Rankings by Subject, please visit Top Universities or QS Intelligence Unit.